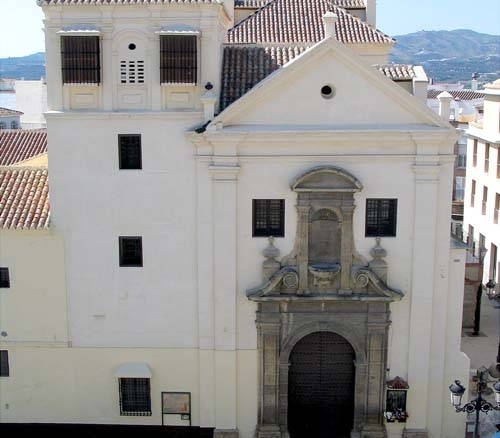 Popularly known as Convent of Las Carmelitas, it was founded in 1702 by the Barefoot Carmelite Order, with nuns from Ecija and Antequera. The Convent has its origin in two houses bought by the nuns from Gaspar Garcia in 1699 which they reformed until it became a closed and uniform building with very few openings to the outside in order to emphasize the rigor of closing. The Church was built between 1738 and 1745; its façade preserves the Carmelite Churches Mannerist style. It has a single nave with important wall paintings which mostly depict Saints. The Chapel of the main Altar where Our Lady of Carmen is worshiped, is a magnificent baroque and polychrome work of art. Address: Plaza de las Carmelitas (Las Carmelitas Square).